FREE highspeed internet 24hrs in your room! We hope you will have a pleasant journey. We will open our gates at 0800am and you could chill a bit in our cosy lobby area, restaurant or balcony, waiting till rooms are freshly cleaned. SEE YOU SOON…and have a safe travel! Chiang Mai is the hub of Northern Thailand. With a population of over 200,000 in the city proper (but more than 1 million in the metropolitan area), it is Thailand’s third-largest city. Located on a plain at an elevation of 316 m, surrounded by mountains and lush countryside, it is much greener and quieter than the capital, and has a cosmopolitan air and a significant expat population, factors which have led many from Bangkok to settle permanently in this “Rose of the North”. Founded in 1296 AD, Chiang Mai is a culturally and historically interesting city, at one time the capital of the ancient Lanna kingdom. Located among the rolling foothills of the Himalayan Mountains 700 km north of Bangkok, it could only be reached by an arduous river journey or an elephant back trip until the 1920s. This isolation helped preserve Chiang Mai’s distinctive charm intact to this day. 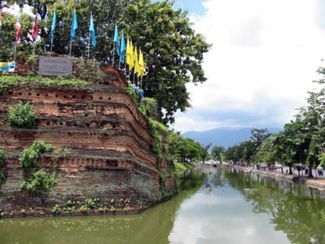 Chiang Mai’s historical centre is the walled city (City is chiang in the northern Thai dialect while ‘mai’ is new, hence Chiang Mai – “New City”). Sections of the wall dating to their restoration a few hundred years ago remain at the gates and corners, but of the rest only the moat remains. Inside Chiang Mai’s remaining city walls are more than 30 temples dating back to the founding of the principality, in a combination of Burmese, Sri Lankan and Lanna Thai styles, decorated with beautiful wood carvings, Naga staircases, leonine and angelic guardians, gilded umbrellas and pagodas laced with gold filigree. The most famous is Wat Phrathat Doi Suthep, which overlooks the city from a mountainside 13 km away. Ratchadamneon Rd hosts the main Sunday night walking street market from Thapae Gate to the popular Wat Phra Singh. Chiang Mai International Airport (CNX) handles both domestic and regional international flights. The route from Bangkok is one of the busiest in the country (Thai Airways flies daily almost every hour, with additional flights in the peak tourist season). Other airlines operating direct services from/to Chiang Mai as well. The airport is some 3 km south-west of the city centre, only 15-20 minutes away by car. Legal airport taxis charge a flat 150-160 baht for up to 4 passengers anywhere in the city; if you take a metered taxi, the fee will start from 50 baht + a 50 baht service fee from the Meter Taxi counter. A variety of daily buses leave frequently from Bangkok’s Northern Bus Terminal (Moh Chit), offering varying choices of price, comfort and speed. Rattling government buses make frequent stops at every minor township. The journey takes around 12 hrs and costs 200 baht. Non-stop 24/32-seaters and 1st class buses provide larger seats and snacks; making the long trip more comfortable. They manage the trip around 9 hours and cost around 500 baht. Be cautious about the so-called “VIP” buses touted on Khao San Rd; they may be cheaper, but you may end up crammed into a 2nd class bus or worse. A Sawngthaew from the Arcade Bus Station to Tha Phae Gate (edge of the old town) should not cost more than 20 baht, though you may have to wait for a driver who agrees. At November 2010, it cost B80 for the trip. But, it is really quite a fair distance. Services from Bangkok’s Hualamphong Train Station leave on a regular daily schedule  and take 12-15 hours to reach Chiang Mai. Daytime services leave at 8:30AM, and 2:30PM with second class (281 baht) and third class (121 baht) carriages. The seats in each class differ in softness and width can become uncomfortable after 10+ hours. Overnight sleepers are a popular a popular with travellers the fold down bunk beds that give you relatively comfortable and good value nights accommodation as well as transport. The trains leaving at 6PM and 7:35PM have 1st class air-con (1253 baht upper bed, 1453 baht lower bed), second class air-con carriages (791 baht bed upper bed, 881 baht lower bed) and regular bogey carriages (531 baht bed upper bed, 581 baht lower bed). Services leaving at 7:20PM, 10PM only have regular carriages and third class seats. Though the carriages are not particularly modern, all classes are clean; fresh sheets, pleasantly fragrant toilet and regularly mopped floors. Annoyingly persistent vendors make regular rounds selling snacks and drinks, or you can Thai and Western meals, politely described by most as uninspiring. Prices are exorbitant, if not utterly extortionate (40 baht for a glass of Orange juice, around 100 for a beer! ); it might be wise to bring your own. For the initial part of the journey, you can lounge in pair of facing seats, till at some late hour in the evening, or on request, the attendant will come around with a special tool to flip down the bunks and make up your bed. At this point you have little other choice but to climb into your bunk, draw the curtain to enclose yourself and be lulled off to sleep by the rocking rhythm of the rail. First class passengers have their own, slightly more spacious, two berth cabin with private toilet, separated from the commoners in the cheap seats. Tickets can be bought up to 60 days in advance at any station in Thailand. Larger stations accept payment with VISA/MasterCard – this is fairly safe, as SRT is a state-owned company. Chiang Mai train station is about 3km east of the city centre. Plentiful Songthaews await each trains arrival or if you want to walk, exit the station, cross the open square in front and turn left on the first major road you come to (Charoen Muang Road); this road goes directly to the city centre. Chiang Mai did have a nice new large air conditioned bus service. These were all over the major city routes but have been discontinued until 2011. There are pedicabs called samlor; the 3-wheeled tuk-tuk; and the most popular, the songthaew. A songthaew are served as both bus and taxi. Not having a local bus service, locals get around the city on songthaew (สองแถว). These covered pick-up trucks have two long bench seats in the back (songthaew means “two rows” in Thai), ply fixed routes or to any destination, picking up passengers enroute who are going the same way. The colour of the songthaew indicates its general route or usage. Most common by far are red songthaews (called rod daeng, red truck), which don’t follow a specific route and roam the main streets around markets, temples or the bus/train stations. These are the most convenient to take if you are going somewhere specific. Prices must be negotiated. but expect 20 baht anywhere within the city walls and 40-60 outside. Because of the city’s somewhat irrational road design, especially inside of the old walls, the driver may be forced to take a circuitous route to get to a nearby destination but will make no difference to the fare. Fixed route songthaews congregate around Warorot Market. From Warorot Market, white songthaews travel to the eastern suburban city of Sankampaeng, yellow songthaews travel to Mae Rim in the north, blue songthaews travel to Sarapee and Lamphun in the south, and green songthaews travel to Mae Jo in the north-east. The all charge a 20 baht flat rate. From Pratu Chiang Mai market, songthaews also travel to Hang Dong (20 baht) and San Patong, south-west of Chiang Mai. To catch a songtheaw; approach a waiting driver or flag one down on the street, state your destination and if the driver is going that direction he will nod in agreement and give you a price. Negotiate a lower fare if you wish. The price agreed to should be per person; it’s a good idea to confirm this with the driver before you leave. On reaching your destination, ring the buzzer on the roof to tell the driver to stop, or most likely the driver will pull over, wait for you to get out and pay. Tuk-tuks are a quick, though noisy way to get around. Fares are usually 40-80 baht for a short hop and 60-150B for longer distances, depending on the proficiency your haggling skills. As a guide, expect to pay 70 baht from the old city to the riverside and Night Bazaar, 120 to the railway station and 120 to the bus station or airport. Tuk-tuks parked near the bus and train stations will ask you for something like 150-200 baht – just haggle or walk away to the nearest road and stop passing-by tuk-tuk or songthaew there. A few samlor (three-wheeled bicycles) still cruise the streets and will happily take you to a temple for the same price as a tuk-tuk, though at a considerably quieter and slower pace. Chiang Mai has metered taxis, though it can be difficult to persuade the driver to switch the meter on. If you do prevail, the flag fall is 50 baht for the first 2 km then 5 baht/km after that, otherwise you will have recur to bargaining a fixed fare. You cannot generally hail taxis in the street. To book a taxi, call +66 53 279-291, state your destination and the call centre will give you a quote; or contact individual drivers on the mobile phone numbers displayed on their vehicle. Copyright © 2019 DIVA GUESTHOUSE CHIANG MAI | Website by MINDSHAPED.